You're staying at the hotel with baby or by relatives? For baby's (and his parents') comfort, rent a baby monitor in Paris, for your stay length, delivered to your doorstep. Visual low battery indicator on both the transmitter and the receiver. "Digital Green Technology": a new technology that combines the zero interference of digital technology with low-power emission levels to protect the baby! Need to rent a baby monitor in Paris for more than 1 month? Contact us for a specific quote. 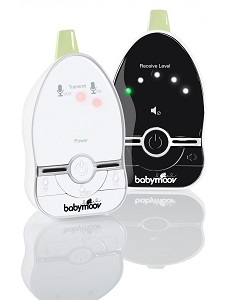 We selected this Babymoov Easy Care baby monitor for its ease to use and its reliability. The baby listener will makes a good product to associate with your crib rental. A good way to relax safely when baby is having his nap in the hotel, by friends or in a rented apartments. And of course, this baby product is delivered to your place in Paris and anywhere in France.